Please select options for Rugged Ridge Window Visors - Matte Black (07-18 Jeep Wrangler JK 2 Door) at the top of this page. 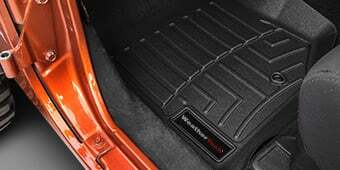 Fits 2007-2018 JK Wrangler 2-Door Models. Easy Installation. 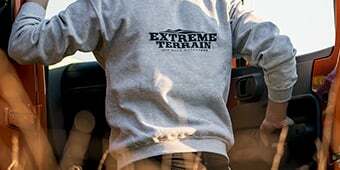 I'm Ryan from ExtremeTerrain.com, and this is my review and installation of the Rugged Ridge Window Visors in matte black, fitting all 2007 to 2016 JKs. Today I'm gonna talk about the construction and, of course, the installation of these visors. A window visor like this will allow you to crack your window while it's raining, while you're driving, or while your vehicle is parked, to allow some ventilation to the interior, without letting the rain in. 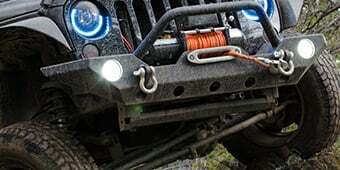 Something like this will also change up the look of your Jeep. So, whether you're looking for the form or for the function, this is a nice part that fits really well. 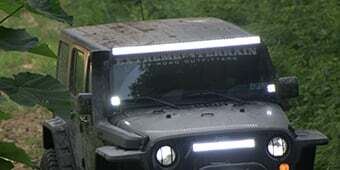 These window visors are made of plastic, and, of course, they have this matte black finish that makes them look good no matter what color your Jeep is, and with a lot of other matte black accents. But these can also be run as a standalone accent piece because they do drastically change the look of the outside of the Jeep. They come with pre-applied 3M tape on them to make installation really easy. All you have to do is peel and stick. Now, anytime you're attaching anything with 3M tape to the Jeep, you want it to be pretty warm out. I would recommend right around 70 degrees, give or take. If not, the 3M isn't going to set up all that well, so the part may fall off. I would not recommend installing these in the dead of winter when it's 30 degrees out. Do it when it's nice out in the summertime, or in a heated garage. 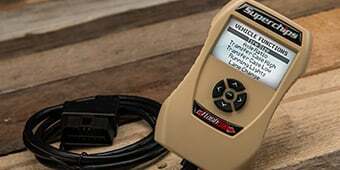 The whole installation shouldn't take you more than a half hour, and you won't need any specialty tools for this, just some cleaning products. These window visors come in right around $100. And whether you're looking at them for the function of being able to open your window a little bit in the rain, or of the form because you like the way that these look, I think $100 is worth it because of how well these fit. They're very well-molded, the finish on them is really nice. Bottom line is, they fit on the Jeep really well. I'm sure you can find a cheaper set of these that won't look as good and won't fit as well. But for my money, for my Jeep, I'd rather spend the $100 at this cost, and get a quality product. So, whether you're looking for a window visor for the function or just for the form, these will give you both in a package that fits really well and, in my opinion, is fairly priced. 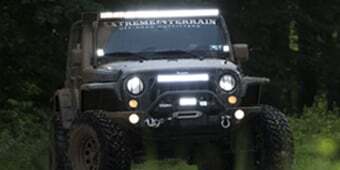 So, that's my review of the Rugged Ridge Window Visors in matte black, fitting all 2007 to 2016 JKs, that you can find right here at ExtremeTerrain.com. Specs. The Matte Black Wrangler Window Visors by Rugged Ridge enable getting fresh air into your Jeep's interior without inviting in the wet as well during a rainstorm. These shaped acrylic visors exclude water and wind, lessen wind noise, but still allow good ventilation of your cabin. Construction. Formed from matte black acrylic, Rugged Ridge's window visors weigh 1 pound and are designed for an excellent fit in modern JK Wrangler windows. Installation is quick and effective with automotive grade double-sided tape, which holds the visors firmly in place. This product comes with a 5 year limited manufacturer's warranty against the usual range of defects. Application. This set of window visors fits 2 door models of 2007-2018 JK Wranglers. great product easy to install will have a great buy fro your buck. Love the look of the matte black window visors on my 2014 2 door Wrangler! The fit is pretty good, door seems to be a hair rounded and the visors are pretty flat, but i am sure the 2-sided tap will hold up, has everywhere else! Great product, easy to install and looks great and works! Fit and look great. Easy application just take your time and measure placement. Adds fit and function. Installation was easy. Don't really notice a lot of functionality with them. This item right here really brings my Jeep out! It adds the class to my Jeep. They were very easy to install and took about 15 minutes. 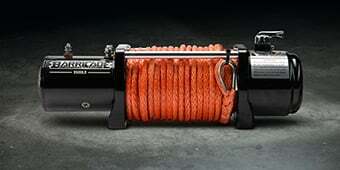 If you got a Jeep you will want to get this item. This is a great product! Very easy to install and it does the job. Great look, easy installation. I have had a lot of compliments on the appearance. Was easy to install and looks great. The color looks good on my jeep. No problems installing. Good product and rain free when window is down half way. Kinda hard to tell if it cuts down on noise levels. I have a soft top. Another feature just to give another look that most Jeep's coming by that don't have..
Bought the rugged ridge stone and bug deflecter and window Chanel’s great fit and looks great !! Easy install. Nice addition to my Jeep. Able to have some fresh air during bad weather without getting wet.